Clarinet-Now.com mission: To help every clarinet player form the correct embouchure, cross the break smoothly, articulate lightly and rapidly, blow with full air support, use fingers/hands efficiently and fluidly, and know the clarinet in a way that there are no boundaries to the interpretation of music. Learning Clarinet? 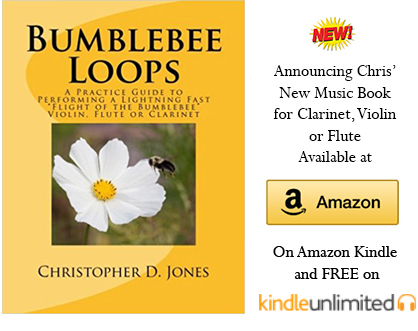 This is what Clarinet-Now has to offer you: Clarinet playing tips from a professional and teacher. I love playing clarinet! This website is an extra resource for my private students and students of clinics, but it is also a resource for students I cannot teach due to distance and/or time. While the following video is a little wacky (okay a lot), watch the efficiency of the fingers. Do they fly high? Are the wrists bumping around all over the place? What is your take on it? Please send me feedback via YouTube or the Contact page. Follow on Facebook click here. This webpage addresses common fundamental problems that students of clarinet encounter. Were they taught wrong? Yes and no. Sometimes the students of the best teachers do not listen, do not catch onto certain concepts, or just they plain develop bad habits. How about the bad habit of ducking your head while playing the clarinet? 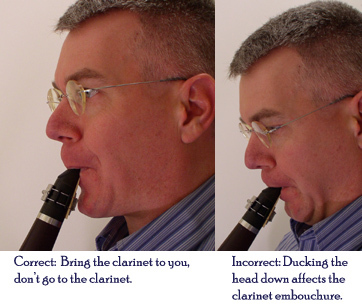 Learn more about proper Clarinet Embouchure here and how to correct Poor Clarinet Embouchure here. What is the difference between amateurish articulation and professional articulation? Sometimes, students just need validation. They do not believe their teacher, so they search for supportive information on the internet. However, bad habits are bad habits, right? Whatever it takes to get the good habits across, hopefully we are is here to help. As a teacher, it is hard to catch it all in the space of an hour, but it is my experience that consistent lessons and consistent practice over weeks, months and years create the best players. Remember this - we are all in this together. We are all trying to conquer the fundamental tendencies of making a clarinet sound natural, beautiful and easy. That is perhaps the biggest challenge, making the clarinet sound easy. P.S. I'm interested in how you are keeping the clarinet current? What music are you playing? Are you appealing to the general public, or even your family members? Log your ideas onto the ClarinetNow Facebook page or visit the ClarinetNow Contact Page. Thanks.